Imagine you're at a party. A totally epic all-night event with hot girls walking around the pool, wearing bikinis and sipping champagne. With ping pong tables covered in red SOLO cups, surrounded by guys with popped collars wearing ironic retro sunglasses and saying "bro". There's a guy in cargo shorts doing a keg stand, and you're pretty sure not everyone here is old enough to drink. You hear cheers from behind you and turn around just in time to see a young man run by, wearing nothing but aviators and carrying a beer in each hand. It's okay, I wasn't invited to that party either. But I was invited to Party Monster. Created by Canadian app makers Steamclock, Party Monster is available as a universal app for the iPhone and iPad, and despite an identical feature set, they each—to my mind—offer a different utility. But I'll get to that in a moment. I didn't have time to throw an awesome party to test Party Monster, so I sat down with my a martini and my dog Pixel to see how well it worked in a me-and-my-dog party environment. I tested both iPhone and iPad versions, streaming music over AirPlay to my Apple TV and imagining a few scenarios where I might be doing this while my attention was divided. 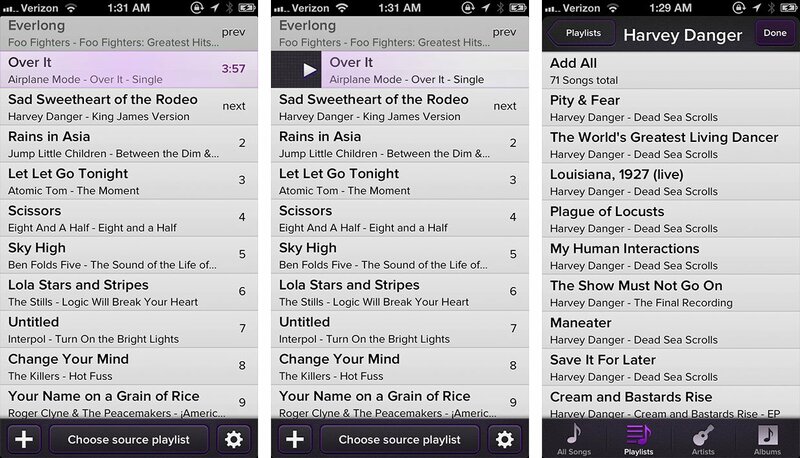 With both the iPhone and iPad versions, you create a playlist on the fly, either based on an existing playlist or by pulling songs from your library ad-hoc. 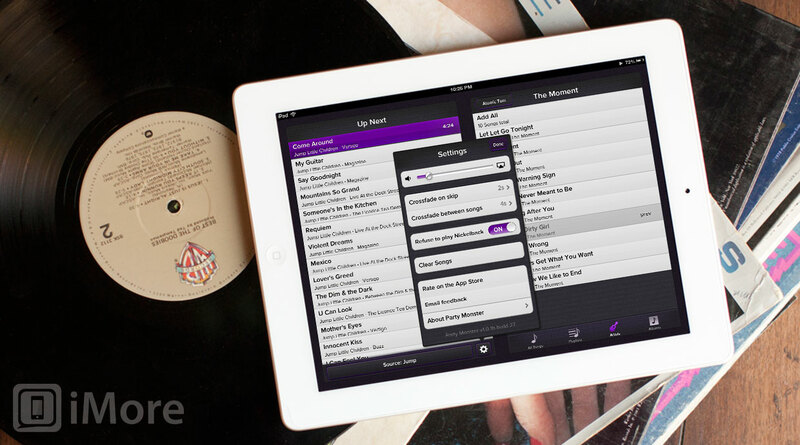 The primary difference is that, with the iPad, you can keep an eye on the playlist view while looking for the perfect track to add. On either device, adding songs is as easy as finding them. Once tapped, they appear in the playlist, next in queue. If you want it to play later in the list, you simply tap and drag it to where you want it. The gestures don't stop there. To play a song, swipe to the right. Swipe right again to pause. To delete a track from the list, swipe left. If it seems like the creators are borrowing from Clear (the gesture-based todo list app), that's no coincidence. Steamclock tells me they were inspired by the simplicity of swipe-based actions, which seemed like a perfect fit for a party music app. Back to my martini party with the dog. 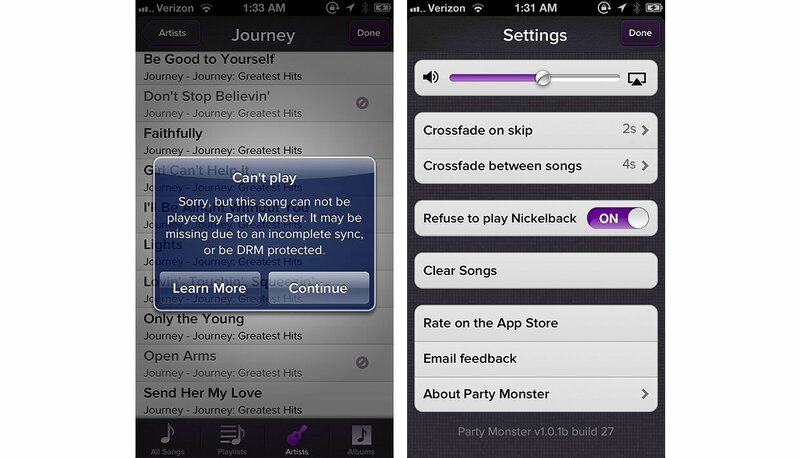 It wasn't all rock and roll; because Party Monster uses the iOS music library, you're limited to on-device DRM-free music. That means that older songs from iTunes won't play, but more notably it means that you'll be hearing a lot of silence if you rely heavily on iTunes Match. Party Monster is kind enough to show a little circle-and-line icon next to unplayable tracks, but as my iPad will attest, using iTunes Match means either a lot of downloading or a lot of repeated songs. Assuming you do have plenty of music on your device, I found the iPhone app to be exactly the sort of thing I would want to use to discretely add songs to a party playlist as the night goes on. Because maybe it's a Halloween party and everyone has kazoos and right now is the perfect moment for Don't Stop Believin' to come on for everyone to kazoo along with. For a more social experience, I'd probably leave my iPad out with the app open and encourage my friends to poke around and help create the perfect mix. And that brings us to the two areas where I think Party Monster really shines. First, as a social experience. With digital everything, gone are the days when you could casually recognize an album cover on a shelf, then poke through a friend's record collection and get a sense of their taste, chatting about your shared favorites and "oh my god you have Harvey Danger's first album dude you should check out their later stuff it's SO much better". Party Monster for iPad gives us a chance to get a little bit of that back. While looking for the next track, your friends will get to learn a little bit about the music you like, for better or worse. That's sure to lead to plenty of laughs and at least a few recommendations. It isn't the first app to do this, but it's the first I've seen that does it well and makes it fun. But then Party Monster offers something completely unexpected: the perfect musical road trip experience. Man, what I wouldn't have given for this app when I rode shotgun with my friend from Denver to Vegas years ago. Or any other time I've ever been a passenger in a car, really. The old method of queueing up each song individually means constantly staring at your device, and while the Music app has offered ad-hoc playlists forever, you have to create the list before listening. Less than optimal. Party Monster not only simplifies the process in a way that any passenger could both use and enjoy, but it democratizes music for the whole car. Pass the phone around and give everyone a chance to contribute. Aside from utility, it's worth mentioning that this is a good-looking app. The interface is light, but where it shows it shines. The purple highlighting is just enough to give you a sense of familiarity and context without feeling heavy-handed like branding. Some of the shadows are a little strong, but if that's how far I have to go to find something to complain about, we're in pretty good shape. Steamclock clearly cares about sweating the small stuff. If I had to request a feature, it would be the ability to save playlists. I know they can't save them to the music library proper, but even in-app saving would be plenty. It's on by default. Canada, we forgive you.